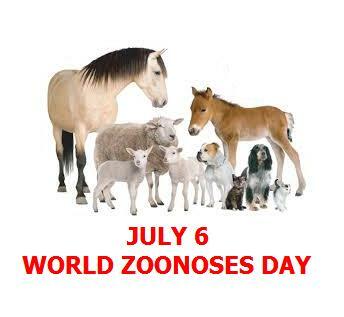 World Zoonoses Day is observed on July 6 every year to emphasize and bring the problem awareness amongst people, and teach them to take right action. Zoonosis is derived from the Greek words zoon ‘animal’ and nosos ‘ailment’. Zoonosis (also spelled zoönosis and zoonoses) describes the process whereby an infectious disease is transmitted between species (sometimes by a vector) from animals other than humans to humans or from humans to other animals (the latter is sometimes called reverse zoonosis or anthroponosis). In direct zoonosis the agent needs only one host for completion of its life cycle, without a significant change during transmission. We participate on ‘World Zoonoses Day’ along with the rest of the world on 6th July 2008, under the hope to leade healthier life, in order to educate and create public awareness about the importance of zoonoses.The term ‘zoonoses’ refers to all disease, mild or dreadful that are transmitted from animal to human beings and vice versa. People can get zoonotic diseases from contact with infected live poultry, rodents, reptiles, amphibians, insects, and other domestic and wild animals. A common way for these diseases to spread is through the bite of a mosquito or tick. Most are aware of mad cow disease and rabies because they make the news headlines worldwide. Sadly, when it comes to more common zoonotic infections like roundworm and hookworm, both of which can result in very bad health problems, most people are unaware. Zoonotic diseases can be caused by all types of pathogens, viruses, bacteria and parasites and can cause various symptoms such as diarrhea, muscle aches and fever. Approximately 150 zoonotic diseases are known to exist. Wildlife serves as a reservoir for many diseases common to domestic animals and humans. Persons working with wildlife should be alert to the potential for disease transmission from animals. Neither animal handlers nor the general public have reason to be alarmed or frightened but everyone should respect the potential for disease transmission and use sound preventive measures. Generally, disease can be easily prevented than treated.